Sophie Jugie, The Mourners: tomb sculptures from the court of Burgundy (exh. cat. New York, Metropolitan Museum of Art, 2010 and Paris, Musée de Cluny, 2012), New Haven, 2010. Sabine Witt, Die Skulturen der Sluter-Nachfolge in Poligny. Stiftungen und Hofkunst in der Freigrafschaft Burgund unter den Herzögen aus dem Hause Valois, Korb, 2009. Stephen Fliegel (ed. ), L’art à la cour de Bourgogne: le mécénat de Philippe le Hardi et de Jean sans Peur (1364 – 1419) ; les princes des fleurs de lis (exh. cat. Dijon, Musée des Beaux-Arts, 2004 and The Cleveland Museum of Art, 2004-2005), Paris, 2004. Pierre Quarré, Claux de Werve et la sculpture bouguignonne dans le premier tiers du XVe siècle (exh. cat. Dijon, Musée des Beaux-Arts, 1976), Dijon 1976. 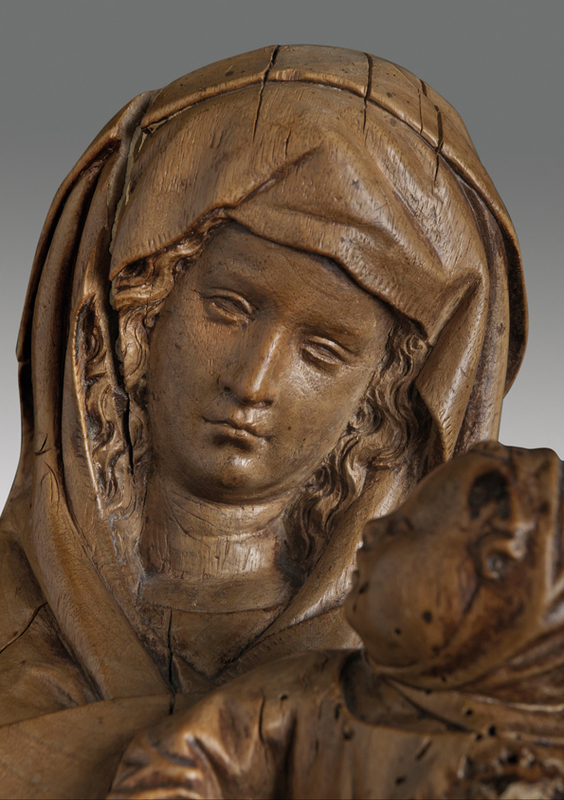 This exquisitely carved walnut sculpture of the Virgin and Child shows Mary holding the Christ child in her left arm; she looks tenderly down at him, whilst he gazes up at her. They hold an open book in their hands and gesture towards it. The heavy and bloated drapery with curving folds, the chubby yet expressive faces and the sense of intimacy in the sculpture clearly indicate its belonging to the School of Burgundy, as Robert Didier stated in an extensive report in 2014. The refined sculpture is of a very high quality in spite of the unfortunate damage to the flank. It has been carved and finished on all its sides which could indicate that it was conceived as a freestanding statue. However, it may also have been part of a sculpted altarpiece. In the Burgundy school and in other schools, sculptures in altarpieces were often highly finished, even on the back. Like most sculptures of this school, the statuette was probably painted and gilded. 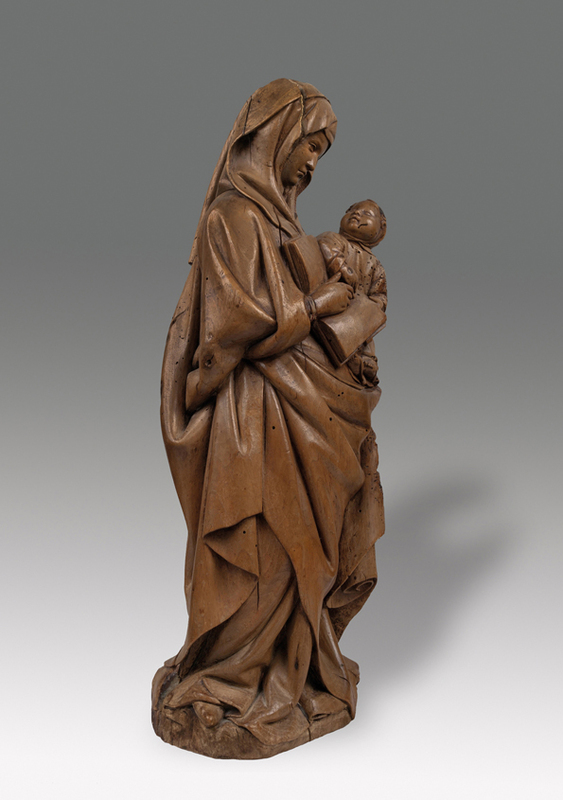 Robert Didier has pointed out the pronounced similarities of the present Virgin and Child with the style of Claus Sluter (c. 1355-1406), indicating that the artist who had executed the sculpture must have trained with him. For example, it shows resemblances with the Virgin and Child sculpted in stone by Claus Sluter and his workshop that decorates the portal pillar in the monastery of Champmol (fig. 1-2), especially in the face of the Virgin, in the way of carving the elongated eyes, the round cheeks and the double chin. Claus de Werve worked on Sluter’s masterpiece, the monumental sculpture known as the Well of Moses (1395-1403), created for the Carthusian monastery of Champmol. He also executed the angels for Sluter’s Calvary in the same monastery. His most important and well-documented undertaking was the tomb of Philip the Bold, which had been planned by his predecessors, Jean Marville and Claus Sluter. Sluter had died before being able to properly work on the tomb, thus it was mainly executed by Claux and his collaborators, between 1406 and 1410. The recumbent effigy was adorned by two angels sculpted by Claux himself, a lion and forty mourners in alabaster. Each mourner shows a remarkable individuality and a different tinge of sadness or anger towards the death of the Duke (fig. 3). This attention to realism and expressiveness is typical of the Champmol workshop. Unlike his uncle who was almost exclusively working for the ducal court, Claux de Werve took a new direction, diversifying his commissions and creating sculptures for private patrons. Hence, the De Werve workshop produced sculptures for noble families, for the clergy and for the municipality. These patrons were all keen to appropriate some prestige by commissioning works from the court sculptor. As underlined by Véronique Boucherat, Claux was a highly gifted and complete master, and his works can be found in several regions of France, especially in Franche-Comté. The well-documented monumental sculpture of the seated Virgin and Child now in the Metropolitan Museum of Art in New York (painted limestone; H.135 x W.114 x D.71 cm) was created for the convent dedicated to Poor Clares at Poligny and was probably a gift of John the Fearless or his wife, Margaret of Bavaria (fig. 4). 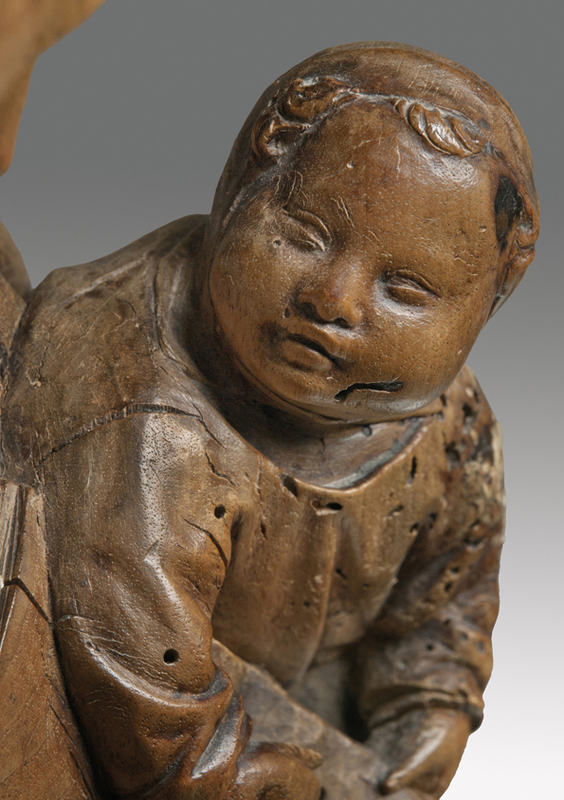 Dated between 1415 and 1417, it shows the intimacy and tenderness distinctive of Claux de Werve’s works. Robert Didier established a strong parallel between our sculpture and the Virgin of the Grapes (limestone; H.130 x W.65 x D.32 cm) in the church of Notre-Dame in Auxonne, recognised as a work by Claux de Werve dated between 1415 and 1420 (figs. 5-6). Looking at the finish of the veil, the delicate round faces, the hands with long fingers and nails precisely sculpted (a typical Burgundian detail) and the voluminous drapery, both Virgin and Child should be, according to the expert, considered by the same artist. He noted however a stylistic evolution between the two sculptures. The Virgin of the Grapes appears further developed in the formulation of the Burgundian canon and therefore he suggests a dating around 1410-1415 for the walnut tree Virgin and Child. 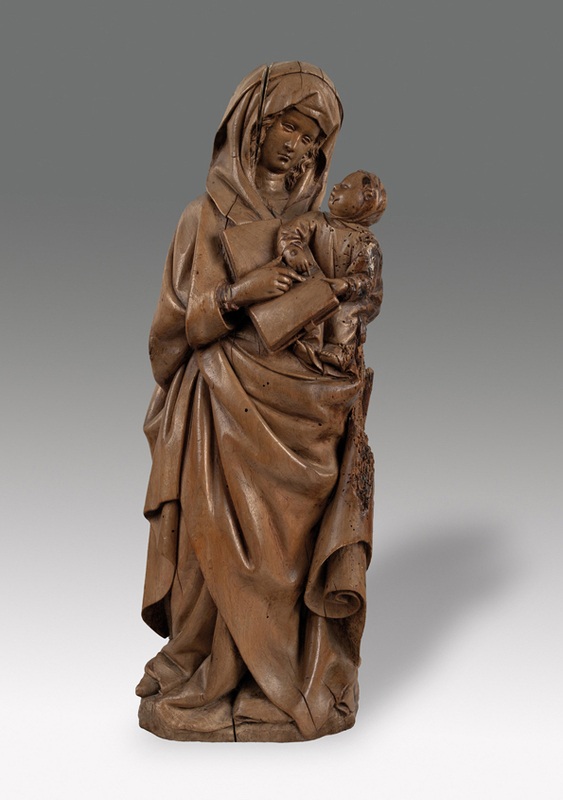 We would like to suggest another parallel with a walnut Virgin and Child (H.39 x W.27 x D.13 cm) kept in the church of Saint-Pierre in Château-Chalon. 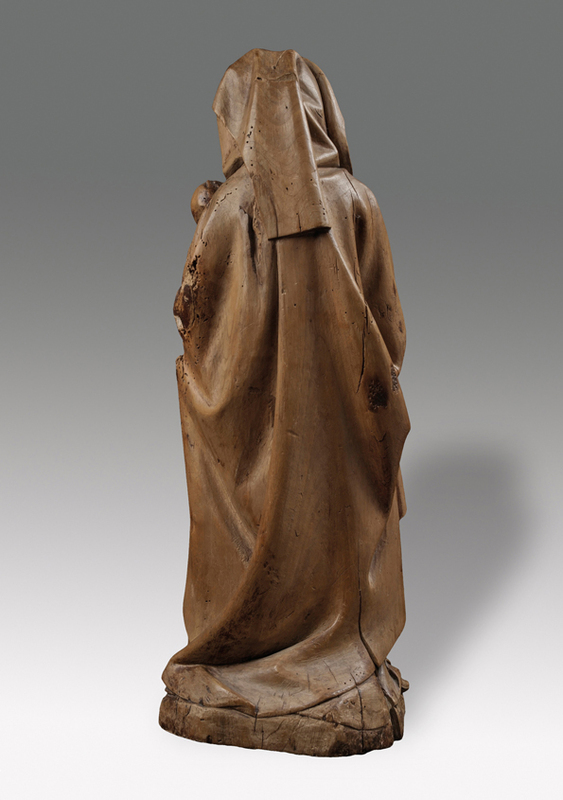 The sculpture, damaged in its lower half, with traces of painting and gilding, has been securely ascribed to Claux de Werve by Véronique Boucherat on stylistic criteria (figs. 7). Strong similarities with our Virgin can be observed in the profile of the Virgin and the round face of the child with a large forehead and very elongated, almost closed, eyes. 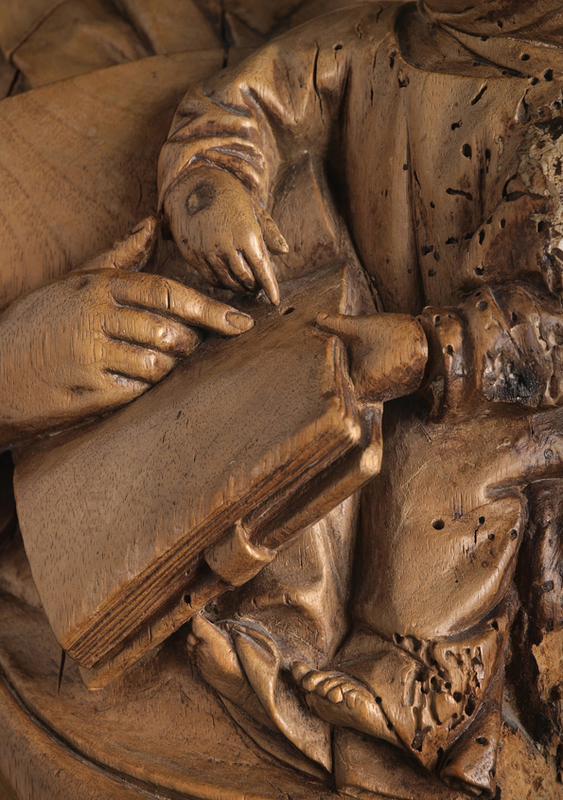 The motif of the Child sliding his fingers into the book is also a recurrent motif and can be seen in several sculptures by Claux de Werve. One interesting detail in our sculpture is particularly rare: the Child’s head is covered by a scarf attached around his neck. This motif appears in two other Virgin and Child from the Burgundian school: in the standing Virgin in alabaster attributed to Claux de Werve or his workshop in the church of Sainte-Marguerite in La Chaux-des-Crotenay (H.85 x W.35 cm) (fig. 8) as well as in the sitting Virgin in the church of Saint-Germain in Molay. On Claux de Werve see in part. Véronique Boucherat, “Nouveaux éclairages sur l’œuvre de Claux de Werve”, in Stephen Fliegel (ed. ), L’art à la cour de Bourgogne: le mécénat de Philippe le Hardi et de Jean sans Peur (1364-1419) ; les princes des fleurs de lis (exh. cat. Musée des Beaux-Arts de Dijon, 2004 and The Cleveland Museum of Art, 2004-2005), Paris, 2004, pp. 317-28. See Sabine de Witt, Die Skulturen…, op. cit., 2009, p. 89 ff. and Véronique Boucherat in L’art à la cour de Bourgogne, op. cit., 2004, cat. 122, pp. 328-330. Véronique Boucherat, in L’art à la cour de Bourgogne, op. cit., cat. 125, pp. 332-3. Véronique Boucherat, “La Vierge de La Chaux-des-Crotenay : un inédit de Claux de Werve”, in Élisabeth Taburet-Delahaye (ed. ), La création artistique en France autour de 1400, Paris, pp. 295-314.